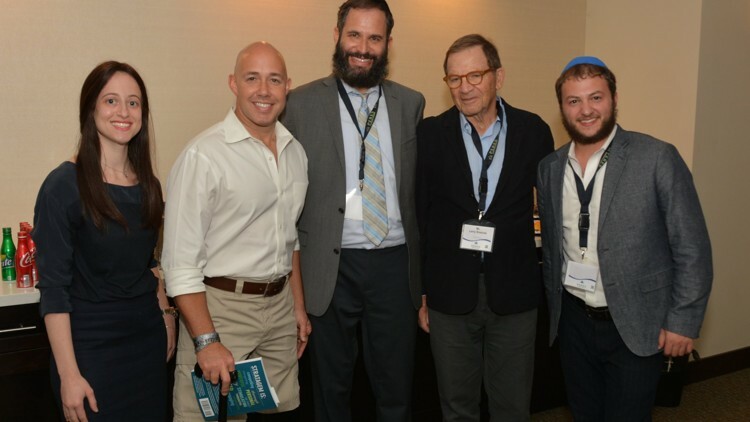 From left: Sarah Dworcan, executive director; Congressman Brian Mast; Rabbi Moshe Scheiner, founder; Larry Sosnow, chairman, and Rabbi Yosef Rice, youth director. Countless disappointing mail openings later, my enthusiasm for mail has never again reached that level, so as you can imagine, I approached opening the letter from the “Peres Leadership Program” with skepticism. When I immediately recognized a long-term friend of mine on the cover, I was intrigued; when I opened the envelope and read the bios of the mentors, I was impressed; and when my mom walked in the room, I was asking her if I could look into applying. It seemed perfect for me. Whether it was designing a candy bar business in elementary school, tracking the real estate market of different neighborhoods in middle school, or playing the stock market in high school, my business inclinations have been clear to me for my entire life. However, I’ve had to explore my fascination with business almost entirely on my own. As much as I enjoy reading everything from Keynes to Carnegie, this program offered the one thing I could never learn on my own: the wisdom of a mentor. Less than a week after finding out that I had been accepted, I found myself excitedly pulling into the valet at The Tideline Resort recently for the first session. After years of hearing stories of mentors catalyzing the development and innovations of their mentees, I had high expectations for everything the next two hours could bring. Before I could even walk through the entrance to the room, I was greeted by chairman and founder Larry Sosnow, mentor adviser Jay Nisberg, Ph.D., and chief mentor Ronald Berk. This quickly turned into a conversation centered around the importance of diligently developing and adhering to a vision. Berk recalled conversations with Steve Jobs and Bill Gates that revealed to him their almost manic obsessions with their visions. Immediately getting to learn about vision from someone who had been the CEO of 14 companies was surreal; my lofty expectations had already been exceeded. Throughout the session, a clear pattern of being dazzled by extraordinary people developed. We began by splitting up into groups, where my admiration only continued to grow for my peers in the program and the mentor we were paired with. Our wide-ranging conversation with our mentor, Nathan Gantcher, who managed a successful investment firm on Wall Street for decades, included insights into the structure of investment firms; a story about his stint at dental school; and denouncements of the portrayal of Wall Street in The Wolf of Wall Street. Then it was announced that Congressman Brian Mast was about to arrive. When he did, he walked with confidence to the front of the room and gave one of the most engaging and inspiring talks I have ever heard. I found his commitment to America and his account of rebuilding himself after almost dying on the battlefield to be particularly moving. His message on vision, developed from his personal experience, to become dedicated to a cause that is truly “worth your time and worth your effort” has deeply resonated with me. His speech ignited a determination within me to make choices that are “better and more important than myself as an individual” so that, just as Congressman Mast has shown, no matter what life presents there is always the potential to get back up and create positive change around me. When I think of the overwhelming sense of promise I felt leaving the first session, I can’t help but be reminded of my journeys down the driveway to the mailbox. However, as I look forward to the remaining five sessions, I feel far more confident in the existence of the treasures that lie ahead. Because the mentors are guiding us to develop our own vision and potential, the opportunities that the Peres Leadership Program has given me are far better than any of the birthday cards I ever received. I’d like to thank Palm Beach Synagogue, Rabbi Moshe Scheiner, Chairman Larry Sosnow and each of the mentors for your vision, generosity and dedication in developing this amazing program. Aiden Segal is a junior at William T. Dwyer High School.